This application note shows how to link two MyPBX in different locations. With this function, we can link branches together with MyPBX. The same method can be used when connect more than 2 MyPBX in different branches. 1. Register the MyPBX A as an extension in MyPBX B via VOIP (SIP/IAX2) Trunk, so the extensions in MyPBX A can make calls to MyPBX B’s extensions via this “Special” trunk. 2. Use the same method to point MyPBX B to MyPBX A. 1) The two MyPBX are linked via VOIP (SIP/IAX2) trunk. 2) All the extensions under MyPBX A are in the format 5xx. 3) All the extensions under MyPBX B are in the format 6xx. 4) Extensions under MyPBX A can make calls to extension under MyPBX B use format 6xx. 5) Extensions under MyPBX B can make calls to extension under MyPBX A use format 5xx. 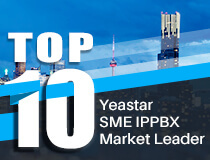 6) Yealink-T28 A registers to MyPBX A as extension 501. 7) Yealink-T28 B registers to MyPBX B as extension 601. Step 1. Set up an extension 509 in MyPBX A. Step 2. Set up an SIP/IAX2 trunk in MyPBX B to link to MyPBX A via this 509 extension. Step 3. Set Outbound Route in MyPBX B, all calls starting with 5 will be sent to MyPBX A. Path: PBX--Outbound Call Control--Outbound Routes--Add Outbound Route. 1) Register an IP phone T28 to MyPBX A with extension 501. 2) Register an IP phone T28 to MyPBX B with extension 601. 3) Use 501 to dial 601. And you can see extension 601 is ringing and you can pick up the calls. Above is the way to route MyPBX B’s call to MyPBX A, the method to link MyPBX A to MyPBX B is the same. The general environment for two MyPBX in different location is: two MyPBX are both behind router and using the private IP. Note: Since the MyPBX doesn’t have the public IP, we need to do port forwarding in the router and make MyPBX is reachable to others. 2. Use the reverse method in MyPBX B to register to MyPBX A.
Step1. Set port forwarding in the router for MyPBX A. Example: The router’s public IP is “102.42.46.126”. Step 2. Set up an extension 509 in MyPBX A. Step 3. Set up an IAX trunk in MyPBX B to link to MyPBX A via this 509 extension. Path: PBX--Trunks--VoIP Trunk--Add VOIP Trunk--IAX Trunk. Step 4. Set Outbound Route in MyPBX B, all calls starting with 5 will be sent to MyPBX A. 3) Use 601 to dial 501. And you can see extension 501 is ringing and you can pick up the calls. Above is the way to route MyPBX B’s call to MyPBX A. Step 5. Use the same method to do port forwarding in router B for MyPBX B. Your public address from network provider maybe a dynamic IP which will be changed periodically. To overcome the problem of dynamic IP, you may need to use the DDNS service, for more info you may Google it. Note: we must map UDP port 5060 and UDP port 10001-10200. Step 2.Configure NAT settings in MyPBX A.
Configure the NAT settings according to below page. Step 3. Set up an extension 509 in MyPBX A. Step 4. Set up an SIP trunk in MyPBX B to link to MyPBX A via this 509 extension. Step 5. Set Outbound Route in MyPBX B, all calls starting with 5 will be sent to MyPBX A. Step 6. Use the same method to do port forwarding in router B for MyPBX B.